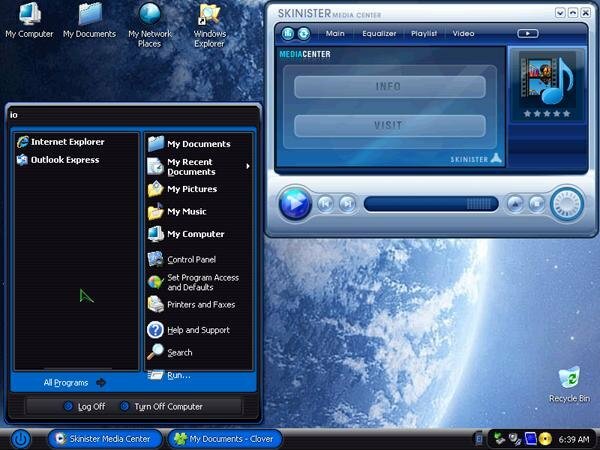 This tutorial will show you how to download, install and use custom Windows XP Themes – essentially you will learn to take that boring old XP interface and give it an exciting makeover. Some programs like WindowBlinds used to make this easy, but since that application no longer supports XP, we’re forced to do it the hard way – but in doing so we’ll also have a greater degree of control over how the interface will look, and it’s also more fun! First, download UXTHEME Patcher from Softpedia. This is a necessary program that allows you to patch uxtheme.dll so XP will recognize custom themes. Note: Be sure to back up this file just in case! I’ve tried running this under XP Service Pack 2 and it made the computer run on a permanent restart loop. If this happens, enter XP using Safe Mode, save your files and reinstall the OS. On SP3 I’ve encountered no problems. The file is virus-free, by the way! Open the UXTHEME program, run it and restart XP. This is a fantastic site to download custom themes – www.thepcmanwebsite.com/themes/ – you don’t need to register, it doesn’t force you to install a third-party installer and it’s all free! Make sure you extract into C:\WINDOWS\Resources\Themes, then right click on your desktop, click Properties and activate your new theme. Feel free to tinker with it on Appearance / Advanced. This isn’t mandatory but you’ll love it – IconTweaker is a free program that lets you change most major icons on your OS. It comes with several in-built icon packages as well! Also, you can download quite a great deal of free icons at findicons.com – make sure you grab .ico files. A simple Google search will yield many mouse cursor packs, and I’ve found a great share on DeviantArt. To change your mouse cursor, go to Control Panel / Mouse / Pointers and go crazy! Cursor files are normally stored in C:\WINDOWS\Cursors. Fonts are easy to download, and sites like www.dafont.com have many of them, all for free. Simply extract the fonts in your C:\WINDOWS\Fonts directory, and apply your new fonts by going to your desktop, opening Display Properties and goint to Appearance / Advanced. If you have a large font library, consider using a free font viewer, such as Opcion Font Viewer, which is my favorite. Go to Control Panel / Sounds and Devices / Sounds to change your system sounds, or you can turn them off. You can use standard wav files from anywhere on your system, but it’s good to store them in C:\Windows\Media. You can find lots of free sounds at www.soundjay.com, but if you’re clever you can also grab various menu sound effects from old games – most use standard .wav format, which XP can recognize. Windows XP is best forever. Not long time ago i used windowblinds to apply transparent themes, but it was not worth to waste resources for. Now i use windows classic theme, all system sounds disabled, cursor is default. Also disabled many useless services (run services.msc), moved recycle bin (not shortcut) to start menu, killed throbber and adjusted all settings for performance – not visuals. Also i placed all needed shortcuts into quick launch, set up folders and drives tree in all folders left side (like in new windows). Now i have fast, responsive old HP Pavilion ze2000 with empty clear desktop (no icons at all) and handy controls.